Working in Haiti since 2009, EarthSpark International has sold over 18,000 small-scale clean energy products ranging from solar lanterns to efficient cookstoves. In 2012, EarthSpark turned on a first-of-its-kind privately operated pre-pay microgrid in Les Anglais, Haiti, a small town that had never before had grid electricity. In 2015, EarthSpark expanded the grid to 430 connections, directly serving over 2000 people with 24-hour electricity powered primarily by solar energy and battery storage, cutting customers’ energy costs by up to 80% over previous energy sources. The community-scale grid is large enough to power small industry while progressive enough to offer accessible service to every single resident living within the infrastructure’s footprint. For those living beyond the grid, EarthSpark continues to support local entrepreneurs in the sale and support of stand-alone solar products. Globally, the electricity sector is changing. Two megatrends underlie the necessity of the transition: Climate Change and Energy Access. 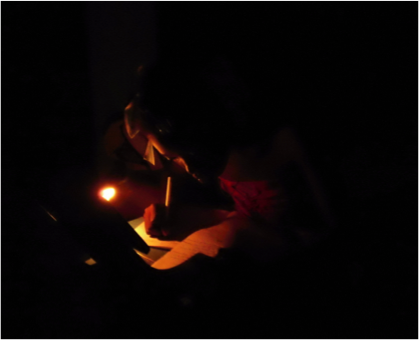 Worldwide 1.2 billion people lack access to electricity and instead spend large amounts of money on low quality energy services such as kerosene, candles and charcoal. Each year, 4 million people die due to indoor air pollution from these inefficient sources of energy and countless more remain locked in poverty. Ironically, important innovation in decarbonizing the global energy supply may come from remote villages that have not yet seen electricity. Where there is no incumbent infrastructure, there is an opportunity to build energy systems with today's best technologies and business models. These models that leverage clean energy, storage, smart grid, and customer participation can be adapted and transferred – South to North – to inform the evolving utility business models in established markets. EarthSpark aims to build eighty microgrids in Haiti by the end of 2022. With one grid up and running, EarthSpark has learned much, but to get to 80, several barriers need to be cleared. With local partners, EarthSpark has led a 100-town microgrid market assessment for Haiti and worked at several levels to clarify the Haitian legal and regulatory landscape for microgrid development and operation. Planning is one thing, executing is another, and the ‘process risk’ in microgrid development remains extremely high. EarthSpark is seeking grant funding to build the next three grids and, in parallel, to build the experience-backed fundable plan for the next 40 grids. EarthSpark’s microgrid development experience to-date has underlined the truth that implementation of a process – the actual building of grids – is by far the best way to de-risk the process for future developments. Electricity in and of itself is useless. It’s what one does with each watt-hour that is truly transformative. With highly efficient appliances, productive uses of electricity, and thoughtful demand management, not only can customers make the most of newly available electricity, operators can maximize customer value and grid revenue. EarthSpark works with communities and customers to deeply assess energy service needs and opportunities. EarthSpark also takes a ‘feminist electrification’ approach to infrastructure planning, ensuring that women’s voices and roles are important throughout the planning and implementation of the electrification process. To meet the Sustainable Energy for All goals established by the United Nations, 40% of all new connections will come from microgrids. Around the world, local governments are looking to microgrids to harden critical infrastructure and improve resiliency. Innovation is portable, and in building a model for clean, smart, transformative community infrastructure, EarthSpark is pursuing deep solutions to both energy access and climate change. Join us!